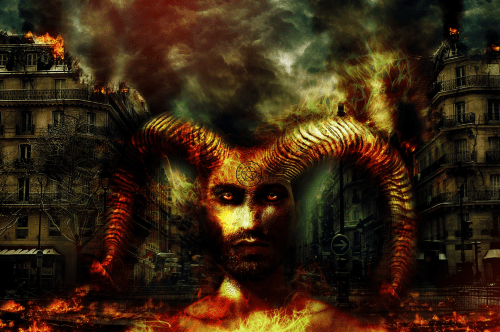 The Devil, Satan and his army of demons and fallen angels are the representatives of all that is evil in the Christian faith. People tend to think of them as a whole, as the antithesis of everything godly. But is there a difference between demons and fallen angels or is the generic approach the right one? 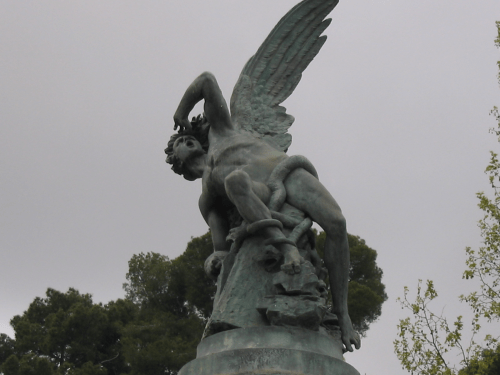 A Madrid (Spain) statue of a fallen angel as he is falling, with the serpent wrapped around his feet, a symbol of his corruption. Fallen angels are the angels said to have followed Lucifer in his rebellion against God, and consequently, in his demise. They are said to form the army of Satan, to live with him in Hell, and to do his dirty work in corrupting mankind in order to win over as many souls as possible. As they were once angels, fallen angels have a form and a gender, and they can walk on Earth among humans. Demons are evil spirits that can harm humans by possessing them. They can cause injuries and illnesses. All representations of demons are similar to what artists imagined Satan looked like, having a human-like form, hooves, horns and a tail. As they are more spirit than real entities, demons cannot be on Earth without possessing someone or something. Let’s see if we understand the difference between fallen angels and demons. There is a lot of confusion even in the texts and in old illustrations. However, there are some ideas on how the two are different. Fallen angels were created by God, just like all the other angels. The origin of demons, on the other hand, is unclear. They simply appear in the text and they seem different from what is said about fallen angels. Most texts simply refer to them as being spirits without a body. As Lucifer challenged God and asked to be His equal, he was backed by some of the angels. In his demise, the followers of Lucifer were doomed to follow him in his banishment to Hell. As they became part of his army, their main goal was to win over souls by getting Man to sin. Devils are evil spirits that usually do more harm through possessions rather than spend their time corrupting souls. Fallen angels, like regular angels, were created in the image of God. They look human and have a gender. They are also said to be beautiful. Demons, on the other hand, are always represented in paintings as having a human-like form but also hooves, horns and a tail, like a goat. As they look just like men, fallen angels can walk the Earth and be the false prophets the Bible warns Christians about. Demons, on the other hand, being evil spirits, cannot exist on Earth without taking a body by possession. While fallen angels have made it their mission to increase the numbers of Satan’s army and to tempt men into sin, demons are usually tricksters and accused of causing harm rather than having a clear role. Some texts claim that it is possible, although difficult, for a fallen angel to get back into the glory of God. The same cannot be said about demons, which are inferior creatures of darkness.